Today’s Census data on poverty, income, and heath insurance. –While this isn’t the best data for inequality analysis, for reasons I note in the WaPo, my piece points out the relative difference between gains at the 10th and 95th percentile. That observation is correct, but the 10th %’ile is a bit of a negative outlier. Better to look at a more stable statistic, the average real income gain for the bottom fifth, up 2.6% last year, compared to a 5.6% gain among the richest 5% of households. The bottom half gained last year, but not as much as the top. Sure, there’s composition effects embedded in there, but they don’t explain away the very long-term stagnation of the series. 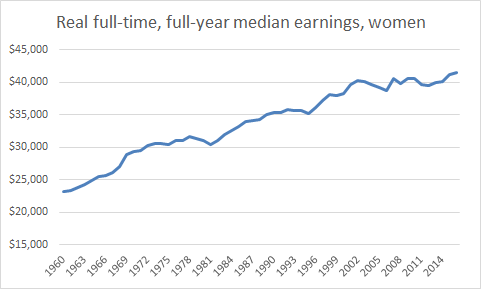 I mean the median full-time guy earns about the same in 2016 as in 1970! The trend for women is considerably more positive, but it too hasn’t gone much of anywhere since around 2000. So, it’s a really solid report, no question, but structural problems persist. Share the post "Today’s Census data on poverty, income, and heath insurance." 2 comments in reply to "Today’s Census data on poverty, income, and heath insurance." Obama had eight years to change exempt status and didn’t. George Bush who everyone said wasn’t as smart, did. You could say it was the Bush advisors running the show, not Bush, but I don’t see how that takes Obama off the hook. And don’t give me it was Republicans blocking NLRB appointments, that could have been addressed much, much sooner. Men are partly stagnating because of women entering the market and getting less pay. How could they not? Perhaps the only reason they don’t sink down to the women’s level is downwardly nominal wage rigidities. 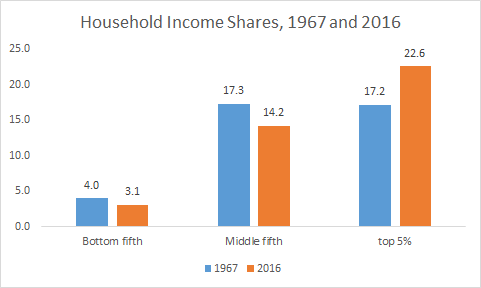 Your household income shares appear to be way off base, possibly inaccurate or misleading at best. Saez as of June 2016 shows the top 5% taking nearly 40% of all income. https://eml.berkeley.edu/~saez/saez-UStopincomes-2015.pdf Go to Table 2 and add the top 5-1% and the top 1%. How do you, or the US census bureau wind up with the top 5% only taking 23 when the top 1% alone is grabbing that portion. While Saez excludes Social Security, and includes capital gains, those differences cannot account for the much smaller inequality measurements you display. Also, not enough emphasis is given to the fact additional income to second wage earners in a household most likely accounted for nearly all of the reported wage gains. One thing that not enough people know about is just how skewed distribution is around the median. By not discussing this you’re hiding probably the most important feature of income distribution, which is the big bump, the most frequent income earned, is way to the left of the median. 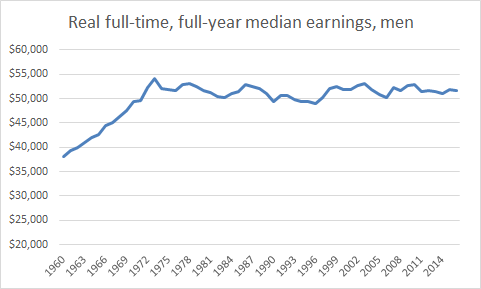 Also median household income hides inequality by not distinguishing between two full time wage earners and one. For starters, median income of a full time worker is around $40,000 to $45,000, but the greater number below the median earn closer to $35,000. Finally, I’d address an important philosophical and rhetorical difference in discussing government programs to help the poor. They alleviate poverty, they don’t lift anyone out of poverty per se. Long term they give the poor a better chance to rise since a starving person usually has more trouble earning money or improving their circumstances than one who is fed. Government handouts to need based recipients are by definition in existence only because of that need, the existence of poverty. I support them, and their counter cyclical nature, but it makes no sense to say they defeat poverty. Eliminating the need for need based programs would be poverty’s defeat. A rich country like the U.S. should be ashamed it can’t figure out how, and find a better way to do this. Great points, “Smith”. Thanks for your effort to inject telling detail.